Since opening on Greenwich Peninsular last year, perched between North Greenwich tube station and The O2 Arena, Craft London has become incredibly popular. Although Stevie Parle’s food is the main draw, from the venue split over three floors – the top-floor bar is also impressive, offering stunning views of The O2 Arena, the Isle of Dogs, and the river. Another prominent nearby building, however, is the Tate and Lyle Sugar Refiners, pierces the skyline on prominent display from the bar. 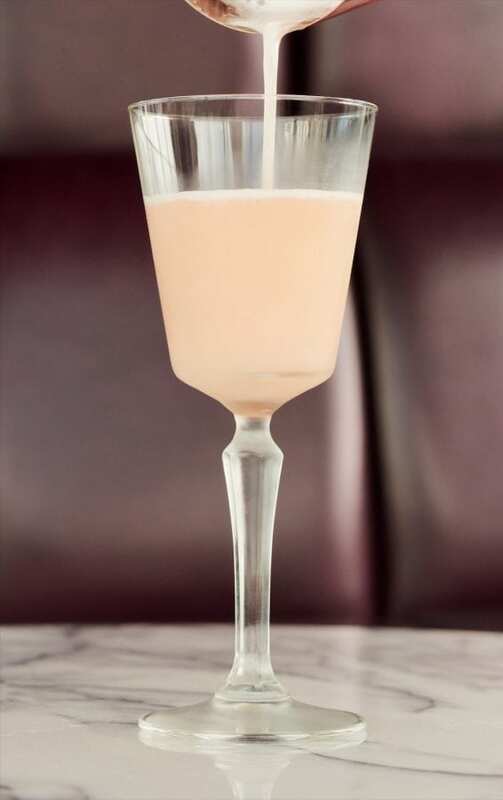 So it seems fitting that a cocktail named after the refinery – Tates Pink Suit – is available from the bar, comprising gin, raspberry vinegar, lemon juice, and – of course – golden syrup. A twist on the classic ‘sour’ the recipe has been made available for readers to recreate at home this weekend. Then add the golden syrup, lemon juice and fruit vinegar. We have a soft spot for Womersley fruit vinegar if you don’t have time to make your own. Strain into the glass of your choice. We use an absinth glass but any pretty coupette will suffice. Craft London can be found at 1 Green Place, London, SE10 0PE. ‘Tates Pink Suit’ is available at the bar, and is priced at £9.